Williamson Park in Lancaster is a 54 acre public park featuring woodland walks with views towards the Lake District from the highest points. However the chief interests for photographers is the Ashton Monument and the Butterfly House. The Ashton Monument was built by Lord Ashton in 1909 to commemorate his wife, and its copper dome is in clear view from passing cars on the M6 motorway. 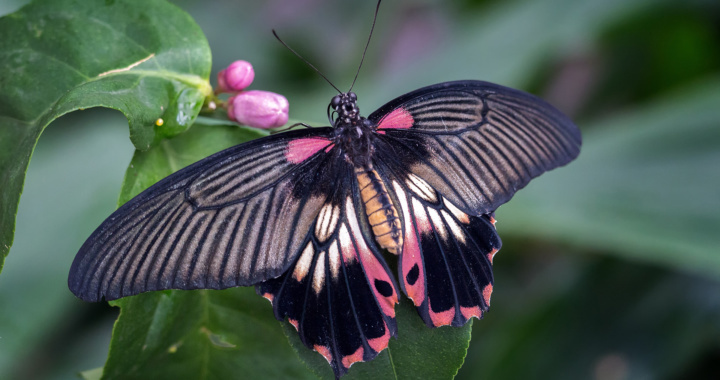 The butterfly house contains a selection of exotic butterflies and a few reptiles. There is also a small aviary and some small mammals such as meerkats, all available for an entrance fee of about £3.90. All the images on this site were hand held as we thought tripods might be a nuisance to other visitors. If travelling from the south on the M6, leave the motorway at Junction 33 and head north on the A6 for 3.4 miles. Turn right onto Barton Road, then left onto Bowerham Road, then right at a small roundabout onto Coulston Road. This leads to Wyresdale road, where the main car park for the ark is located (parking fee of £1.80). If travelling from the north, leave the M6 at junction 34 and turn right onto the A683 (Caton Road). After 1.6 miles turn off slightly left onto Bulk Road, then hard left onto Ridge Lane. At the next roundabouut turn right onto Kentmere Road, then first left onto Borrowdale Road and first right onto Ullswater Road. At the junction with Moor Gate, turn right onto Wyresdale Road to reach the car park described above after a further 0.5 miles. Posted in Lancashire and tagged Gardens, Park.